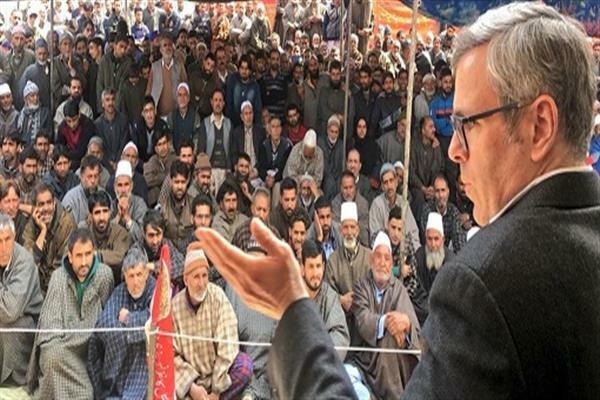 Beerwah, Mar 22 (KNS): National Conference Working President Omar Abdullah on Thursday said the overwhelming sense of despondency in J&K must be replaced with hope and sustained peace to usher the State out of the current political vacuum and morass it has been left in by the powers that be. Addressing a workers’ convention of the party in Nasarpora, Beerwah on Thursday, Omar Abdullah said continued alienation of the youth and the spurt in local youth resorting to armed militancy was a grim reminder of how rank political opportunism and U-turns by the ruling dispensation had pushed the State back into the throes of turmoil and chaos. 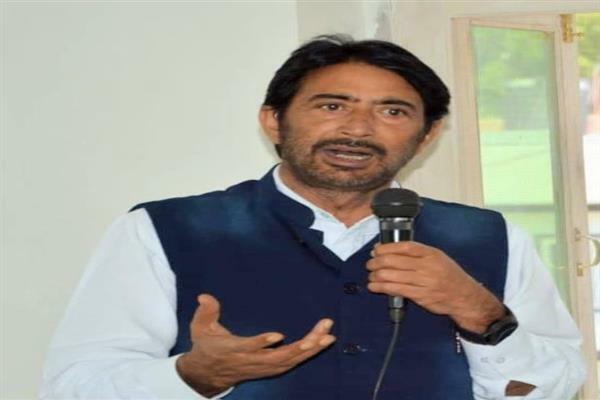 “Since the past three years, the situation in the State and especially Kashmir has deteriorated in every aspect as the youth are still reeling under the psychological ramifications of PDP’s brazen sell-out to the BJP. Every promise made by PDP to seek votes in 2014 stands broken without any regret. While the situation on the LoC continues to be grim and precarious with growing casualties, internally a renewed spurt in local militancy has indicated widespread disenchantment with the present Government and to a certain extent the system it represents at present. If PDP leaders printed hoardings claiming credit for peace initiatives between India and Pakistan, including the bus-service and the LoC trade – they should also accept the blame for every shell that decimates peace on the Line of Control and results in loss of lives. They promised us dialogue between New Delhi and Islamabad and internally between New Delhi and stakeholders in Kashmir as a smokescreen to justify their alliance with the BJP. Where is that dialogue? What happened to apparently the very basis of your compromise?”, the National Conference Working President said. The National Conference Working President said the State Government’s rampant abuse of power and growing intolerance towards the people was pushing the youth towards the wall. “We now have a Government that sacks senior doctors for their facebook posts which reveal the truth. While the kith and kin of their leaders are given plump gazetted jobs, the educated young man has been robbed of his right to a dignified and sustained employment. We have repeatedly asked the Government to revoke SRO-202 but these pleas seem to fall on deaf ears as the priorities of this Government are clear and evident. As unemployment is perhaps a about to cross the one million figure, the Government continues to look clueless and unconcerned. When you have money to pay the children of your leaders who you have given these plump, custom-made government jobs – why don’t you have money to pay a dignified, realistic salary to our highly educated youth?”, the NC Working President added in his address. Pledging his continued dedication to usher Beerwah into an era of progress and development, Omar Abdullah said Beerwah – as is being considered for other areas in the State and especially Jammu – deserves a District Status on account of its size and topographical profile. “Beerwah consists of four Tehsils and should be considered for a District status if the same is being done elsewhere in the State. There should be no discrimination with Beerwah purely based on the Government’s partisan outlook of governance. 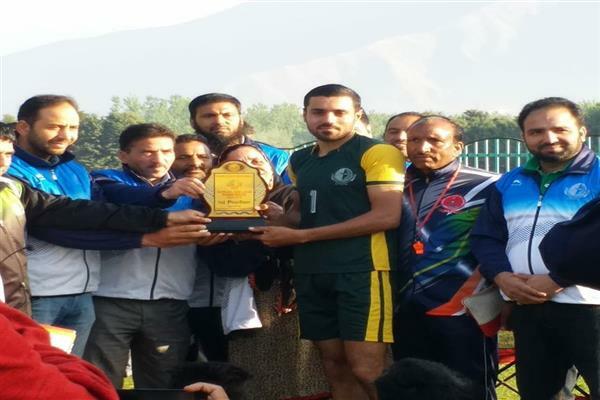 If there could be an ADC stationed outside a District Headquarter in Jammu, a similar arrangement would not be out of place in Beerwah and the Government should seriously consider the demand of creating an ADC Office in Beerwah”, Omar Abdullah added. The National Conference Working President also assured the people that he would do his best to expedite the initiation of work on the Zampatyar Water Supply Scheme in Khag which would benefit around fifty villages.